Andale Andale, Come and Play This Slot! This slot game from Novomatic takes inspiration from the legend that is Speedy Gonzales! He would tell you to hurry up and play this slot game. 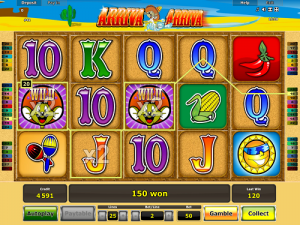 Speedy Gonzales was the fastest mouse in all of Mexico and Arriva Arriva is one of the highest-paying slots in all of Novomatic’s collection! This slot game has a Mexican cartoon theme. It’s bright, fun and funky! All of the rich colours, in the background, on the reels and on the symbols are a feast for the eyes. These reels are located in the middle of the Mexican desert. The sand is the dominant feature in the background but, above the reels, is a beautiful oasis. There’s a lone cactus standing on the left-hand side of the logo. Everything about this slot is inspired by Mexican culture, including the symbols and the music! Arriva Arriva has five reels, each with three rows, and twenty-five paylines altogether. Gambling wins is possible in this Novomatic slot game! You can also play manually or with autoplay on. It’s a really high-paying slot game, with a theoretical RTP of 95%. With Novomatic, you don’t have to travel all the way to Mexico to experience this charming culture! Those of you who are Speedy Gonzales fans will go crazy for this game. If you’re a regular player of any of these other slot games from Novomatic: Book of Ra Deluxe, Lucky Lady's Charm Deluxe, Flamenco Roses or Sizzling Hot Deluxe, then Arriva Arriva will also tickle your fancy! Along with some generic slot symbols, the values of playing cards, there are some wonderfully colourful, Mexican-style symbols on the reels of Arriva Arriva! The playing card-inspired symbols include: 9, 10, Jack, Queen, King and Ace. In ascending order of value, these are: a delicious-looking corn on the cob; a cactus wearing a sombrero and playing a guitar; two red hot chilli peppers; the happy sun and the two maracas. The best thing about playing a slot game is getting payouts! To win in a slot game, you’ll need to match up the right number of symbols in the right places. Every slot game has its own rules! Arriva Arriva has pretty standard rules for a Novomatic slot. Fans of this software vendor will know instinctively how it works! Basically, there are twenty-five paylines running from left to right across the reels. Depending on the symbol, you’ll need to land at least two or three of the same symbol in positions that follow one of the paylines. Don’t forget that only consecutive matches count, so you can’t leave any gaps on the payline. The only symbol that can help you when there is a gap is the Wild symbol. This Wild symbol is a mouse that looks like he could be Speedy Gonzales’s twin brother! He helps you to turn incomplete wins into payouts by standing in for the missing symbol! He can work his magic from anywhere on the reels, as long as he lands in a gap that will help you win. One of the best things about the mousey Wild is that he doubles the wins to which he contributes! Any payout where the Wild mouse has stood in for a missing symbol will be multiplied by two! As is pretty much standard in Novomatic slot games, you can adjust the settings to suit you. This includes the number of paylines as well as your bet per line. If you want, you can have all twenty-five paylines active but you can have fewer active if you want. It’s easy to change this – just use the plus and minus buttons at the bottom of the reels. Similarly, you can increase or decrease your bet per line to any amount you want. There is a minimum and maximum so any player with any gaming budget can feel comfortable. Thought that was it? No! There’s more! Arriva Arriva has one more symbol and this is Speedy Gonzales’s favourite: a piece of cheese! When at least three of these Cheese Scatter symbols arrive on the reels in the same spin, the Arriva Bonus will begin! Uncover matching symbols to see how many Free Games you’ll get. You can get anywhere between 10 and 30 Free Games! That’s not even it! During these Free Games, ALL wins are doubled – not just the ones which are completed with a Wild symbol. Just think how much you could win by playing 30 Free Games where all the wins are doubled!